The Caribbean had special significance for John and Ida Mae, who died in 2017 and 2018 respectively. Their initial mission trip to the Bahamas in 1969 sparked what would eventually become Maranatha Flights International. "The reason we picked this site is because it brings a lot of things together about the Freemans," said Maranatha president Don Noble. "They did a lot of work in the Caribbean, flew their plane out here, and this particular site sits high above the Caribbean, almost like you're in an airplane flying above it." In September 2017, Hurricane Maria destroyed 28 of 34 Adventist churches on the island, including the Beryl church. The Category 5 storm caused such widespread destruction that it left the people of Dominica feeling hopeless. 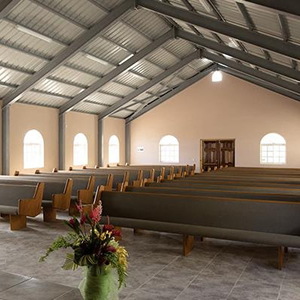 "We all know what happened here two years ago, so having a church rebuilt is like the nation is rebuilt also," said Elie Henry, president of the Adventist Church in Inter-America. "What's more, for us it means that the church of God is taking a new step to continue the mission we have here on this island. We want to take this opportunity to thank Maranatha Volunteers International for the work they have done." 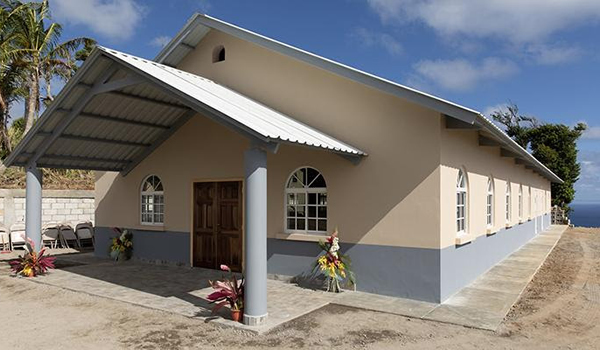 Besides the Beryl church, Maranatha has agreed to build three additional structures on the island that were damaged by the hurricane, including the Wesley Adventist church community center. It is the second time Maranatha has assisted with reconstruction efforts in Dominica. In 1979, Maranatha helped to rebuild schools and houses after Hurricane David.